A split diamond interchange joins Interstate 210 with U.S. 90 Business (Broad Street) and U.S. 90 (Frugue Street) to the immediate south of I-10. Photo taken 05/19/14. U.S. 90 Business runs along the west side of I-210 and concludes at U.S. 90 a half mile south of Interstate 10 (Exit 12). Photo taken 05/19/14. 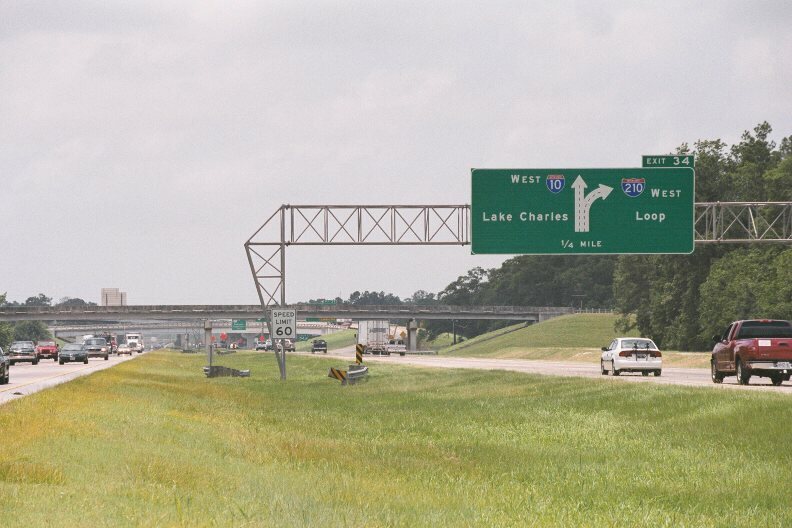 A left exit leads motorists back into Lake Charles along Interstate 10 west as the I-210 mainline merges with I-10 east. Photo taken 05/19/14. 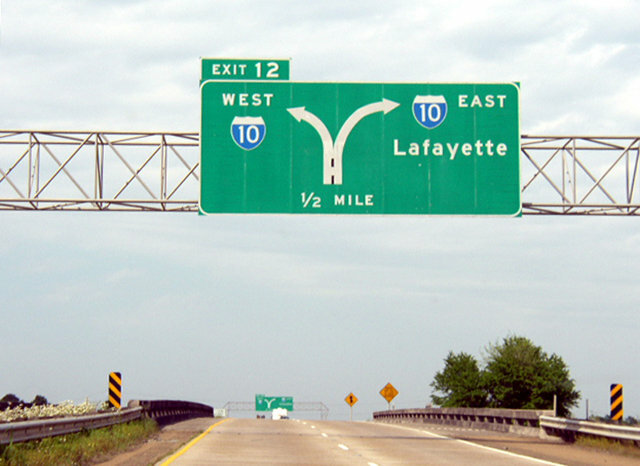 Traffic separates at Exit 12 for Interstate 10, 63 miles west of Lafayette. Photo taken 05/19/14. 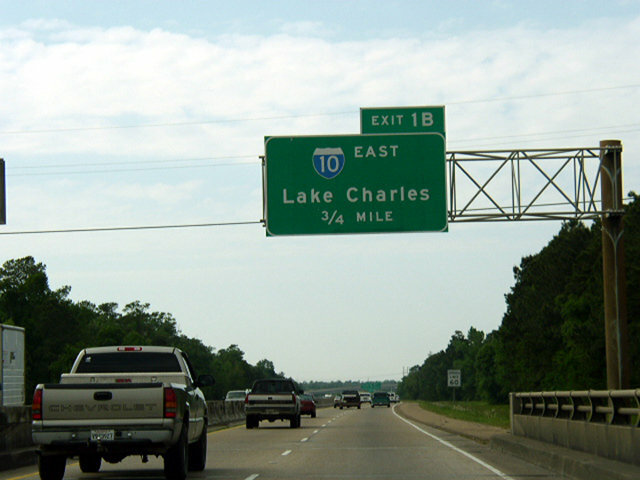 Interstate 10 travels 1.5 miles west from a parclo interchange (Exit 36) joins LA 397 to the Lake Charles Bypass. Photo taken 05/19/14. Interstate 10 narrows to four overall lanes at the directional T interchange (Exit 34) with I-210 west. Photo taken 05/19/14. Exit 34 leaves I-10 west beyond the Goodman Road overpass for Interstate 210. I-210 heads south four miles to LA 14 before turning west toward Prien Lake Mall. Photo taken 05/19/14. Interstate 10 at the westbound split with I-210. Photo taken 05/19/14. U.S. 171 stems north from U.S. 90 (Frugue Street) to cross paths with Interstate 10 one mile west of I-210. U.S. 171 travels north from Lake Charles to DeRidder and Leesville. Photo taken 05/19/14. No control points are posted for Interstate 210. 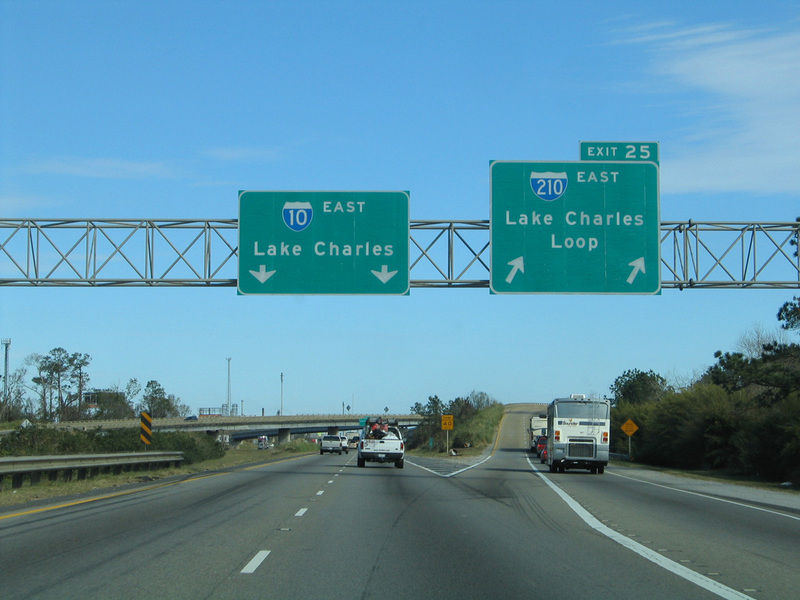 The Lake Charles loop links I-10 with LA 14 and LA 27 south toward Cameron and the Gulf coast. Photo taken 05/19/14. I-10 crosses Kayouche Coulee leading into the directional T interchange (Exit 34) with Interstate 210 west. Photo taken 05/19/14. Exit 34 parts ways with I-10 east for I-210 west to adjacent U.S. 90 and the south side of Lake Charles. U.S. 90 parallels I-10 throughout southwestern Louisiana, overlapping with the freeway at the Texas line and again at Lake Charles. Photo taken 05/19/14. 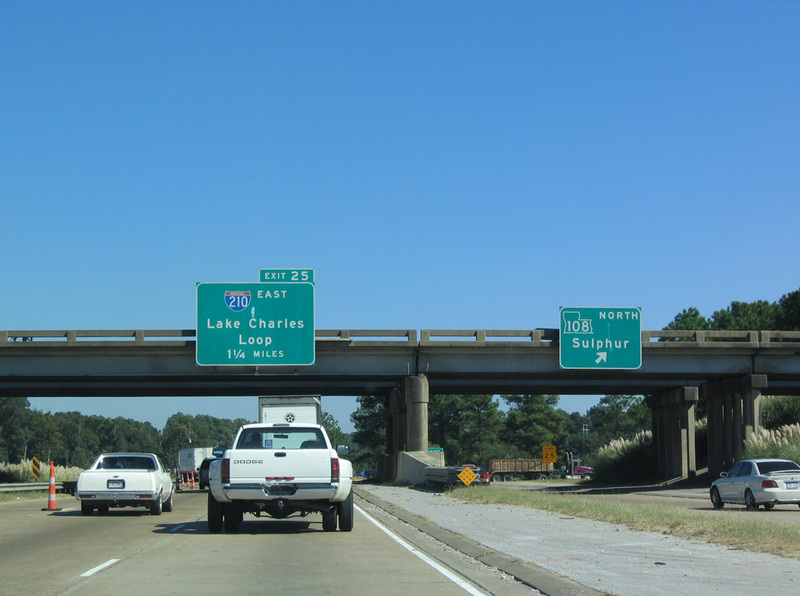 Replaced sign bridges on I-210 east at I-10 along the east side of Lake Charles. Photos taken by Chris Patriarca (04/08/03). Westbound Interstate 10 at I-210. I-210 bee lines northwest from the high level bridge over Prien Lake to Interstate 10 in east Sulphur. Photo taken 05/19/14. 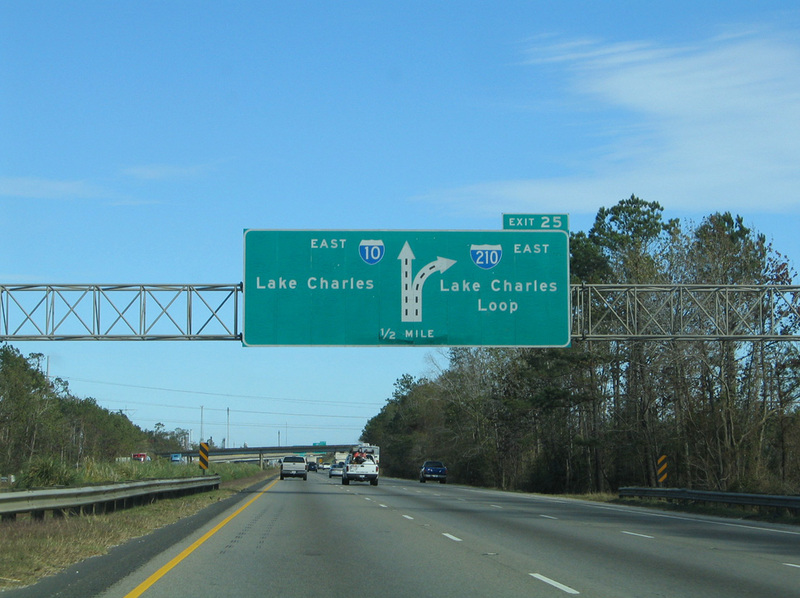 The succeeding off-ramps at the west end of I-210 lead to Interstate 10 back into Lake Charles and Pete Manena Road (Exit 1A). Photo taken 05/19/14. 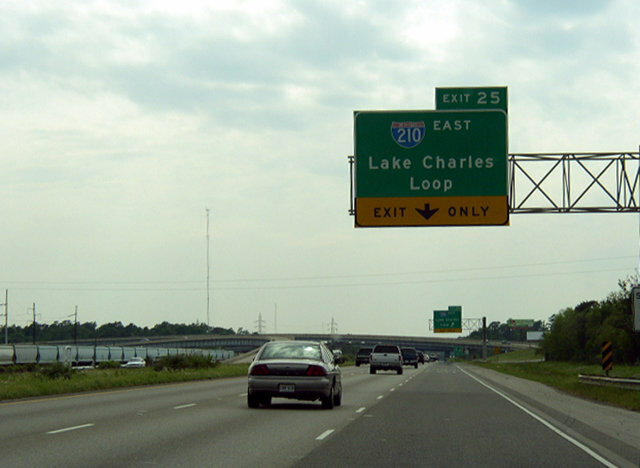 Exit 1A departs for Interstate 10 east to West Lake and Lake Charles. U.S. 90 combines with the freeway in 1.75 miles. Photo taken 05/19/14. 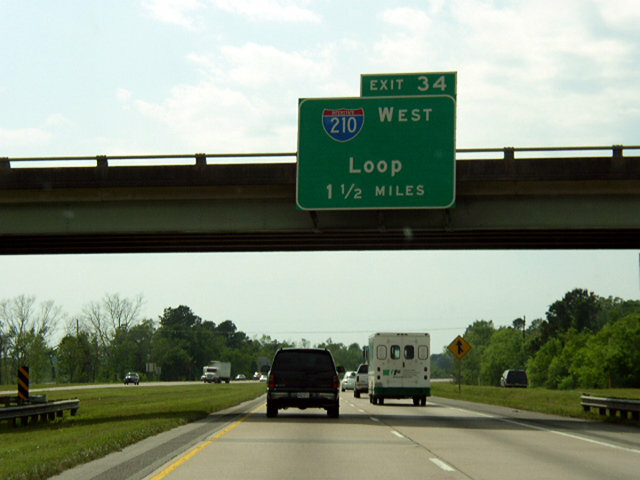 The mainline of I-210 defaults onto westbound Interstate 10 to Beaumont and Houston, Texas. Exit 1A connects with the south side frontage road of I-10 to adjacent industrial sites. Photo taken 05/19/14. 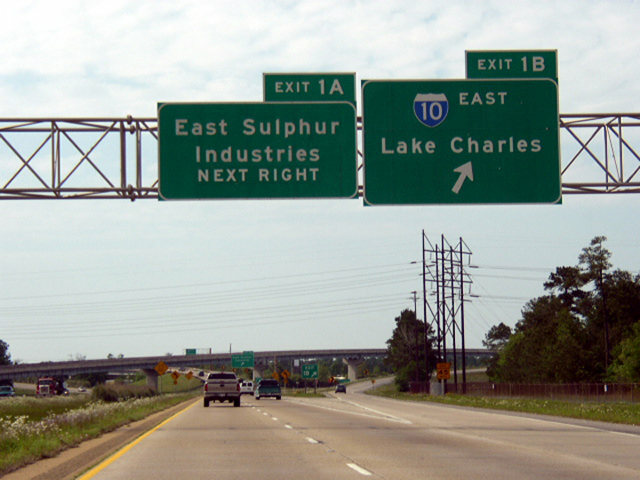 I-10 travels east through the city of Sulphur and splits with I-210 a mile beyond the cloverleaf interchange with LA 108. Photo taken 05/19/14. 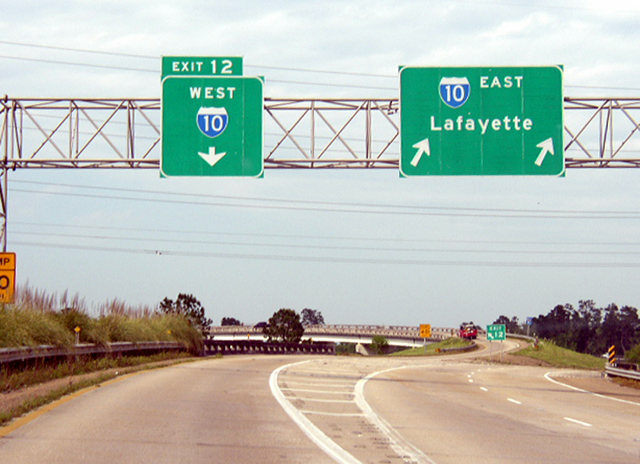 An auxiliary lane extends from the c/d roadway with LA 108 to the separation with Interstate 210 at Exit 25. Photo taken 05/19/14. 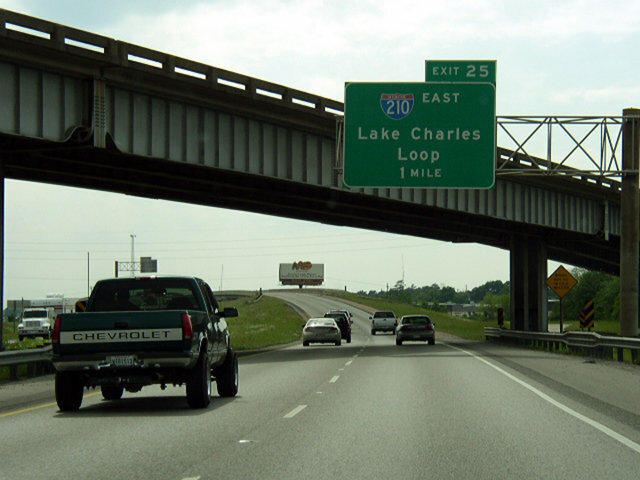 Interstate 210 branches southeast across Prien Lake toward the unincorporated community of Prien and the south side of Lake Charles. 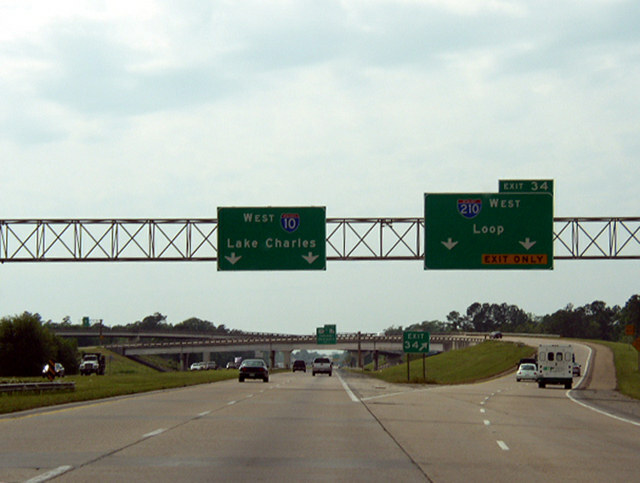 The bypass connects with LA 385 south to Cameron Parish. Photo taken 05/19/14. Entering the two-wye interchange (Exit 25) with Interstate 210 on I-10 eastbound. Photo taken 05/19/14. I-10 trends southward from the split with U.S. 90 one mile to Interstate 210. Photo taken 05/19/14. The on-ramp from PPG Drive adds an auxiliary lane to Exit 25. The flyover for I-210 east serves trucking interests from area industries. Photo taken 05/19/14. 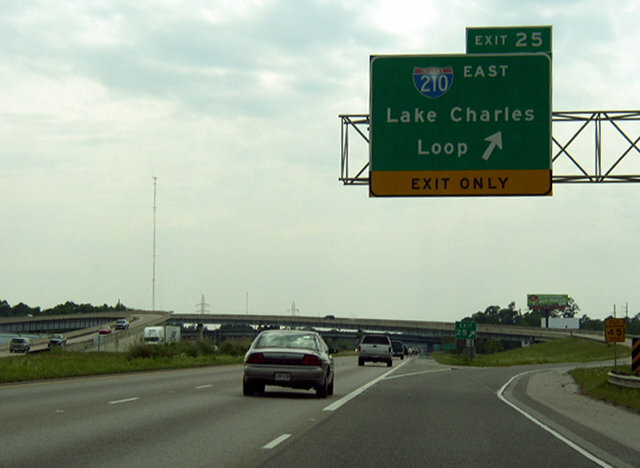 Exit 25 leaves I-10 west for Interstate 210 east back toward Lake Charles. 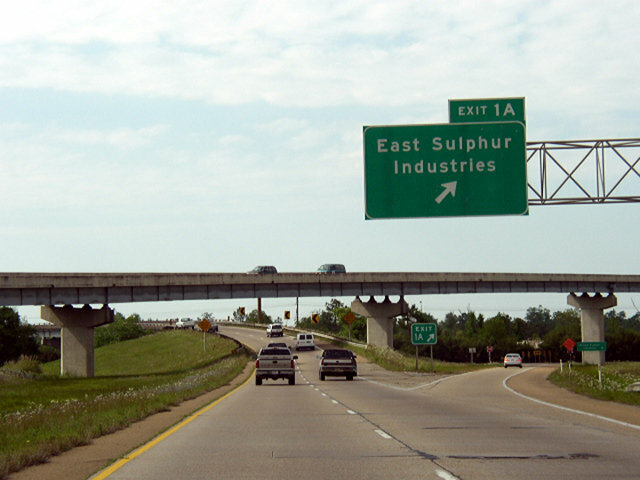 I-10 crosses into the city of Sulphur on the west side of this exchange. Photo taken 05/19/14. 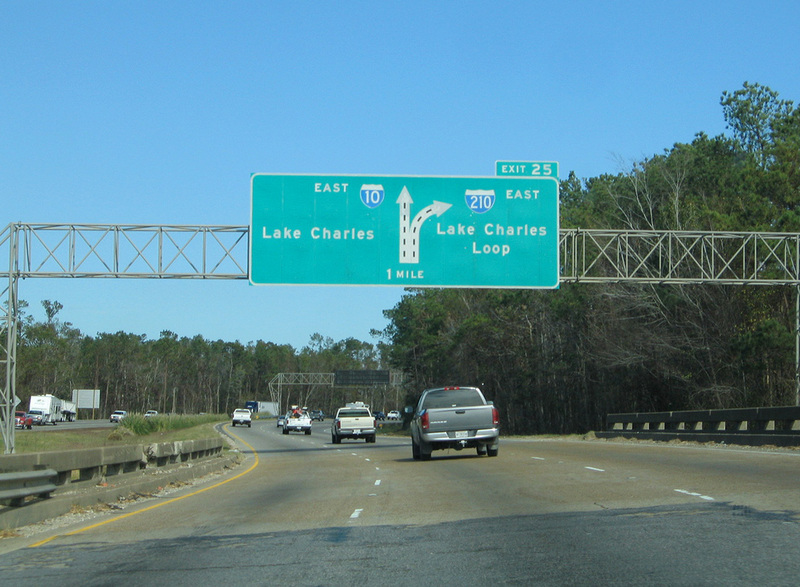 Previous guide signs for Interstate 210 along I-10 referenced the freeway as the Lake Charles Loop. Previous guide signs for the west end of I-210 at Sulphur. Photos taken by Chris Patriarca (04/08/03). I0210 over PRIEN LAKE, Calcasieu Parish, Louisiana. BridgeReports.com. “Script for Half Looped: Part 1.” KPLC TV 7, Lake Charles, LA, February 25, 2004.